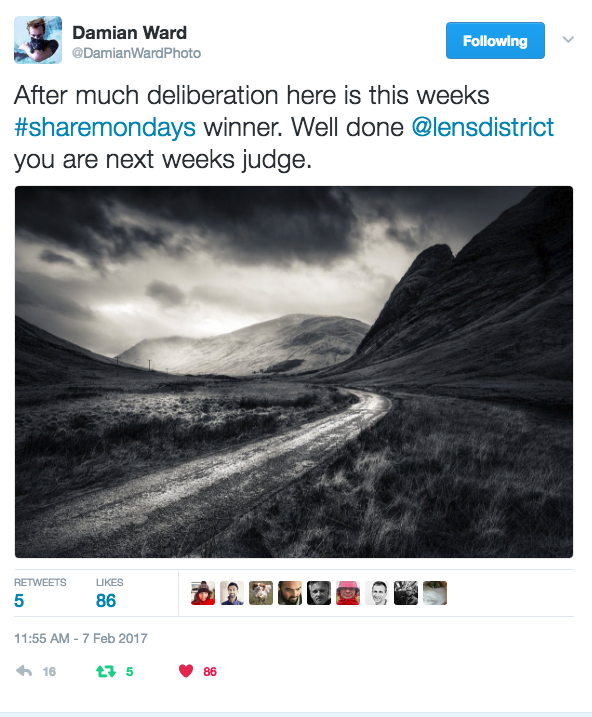 The concept of #Sharemondays is a platform where photographers can share their images with one another on Twitter through a weekly competition. Unlike other weekly competitions it has no affiliation to a company or agendas from individuals, just wholly for the experience of sharing and that also includes sharing the task of judging. The basic rules are to share your favourite image on a Monday from the prior 7 days (Monday-Sunday) on twitter using the hashtag #Sharemondays. On the Tuesday (where possible) the winner from the previous week will pick a winner from all the entries. They may (but not being compulsory) wish to also post a long list or shortlist or both before announcing their chosen winner, ideally tagging the photographer(s) concerned along with the #Sharemondays hashtag. The winner will then become the following weeks judge and so on, allowing the competition to basically run itself and also keeping the judging fresh as it changes every week. Hopefully with this simple concept the competition will continue to grow and it will run for as long photographers are interested. I plan to post the winners on here or a website that may well be up and running soon, allowing the years collection to grow and hopefully show its diversity of judging. If it does continue to be as popular as it has in the past, there is talk of putting together a book of the yearly winners as a collection of 52 images. It will obviously be a non profit collection, set up to be bought on demand for the cost price and is an exciting prospect which would be a great way to showcase the talent selected throughout the year, and also add a little incentive to the weekly competition. 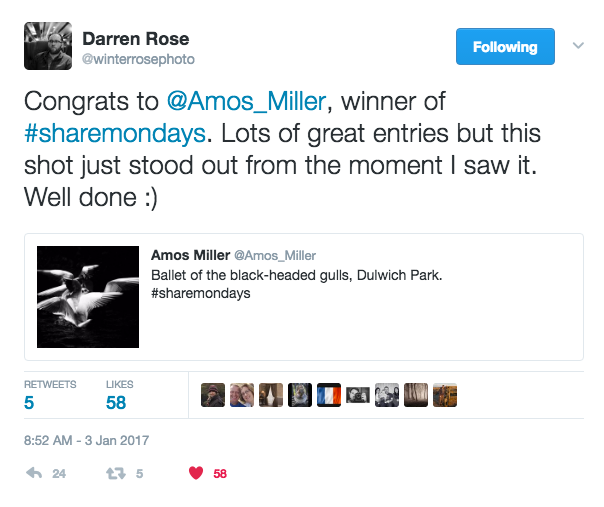 Once we have a website set up, the winning images will hopefully be showcased there but for now I have posted the tweets of the winners so far this year and will add them each week until the rest gets finished. So lets see how this all turns out, hopefully an exciting project for all which encourages sharing of images and the experience of judging.